KEY FEATURES: Massive herb, to 1.5m., with large, arching, sword-like leaves and large spider-like flowers. 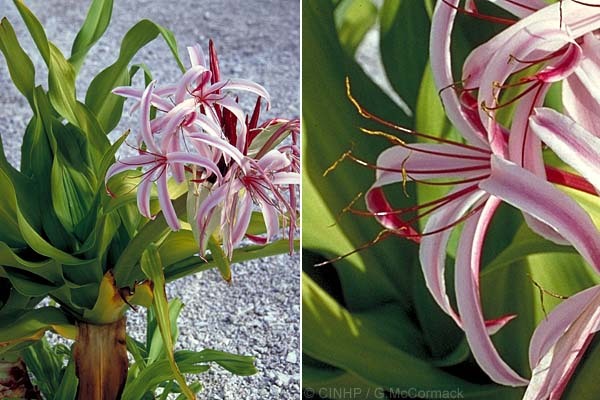 SIMILAR SPECIES: Crinum augustum includes Crinum amabile. The famous "Queen Emma Crinum" of Hawai‘i from Sumatra, is variously listed under both scientific names. IDENTIFICATION: Massive herb, to 1.5m. LEAVES whorled, sword-like, 150x20cm, dark-green. FLOWERS stem (scape) 100cm, falling to ground after flowers open, with terminal cluster of 15-30 flowers, fragrant; FLOWER stalk 3cm; corolla tube 12x0.5cm, dark purple, 6 sword-like petals (=lobes), 15x2cm, outside dark purple, inside white to pink; filaments 6, purple; style shorter than stamens, purple. FRUIT none, always sterile. Pukapuka: fieldspecimens, very common, 2/2004, ID to be checked, flower stalk green!!!! !